In the second week of October, two dissemination events were held at universities in the Benelux region. 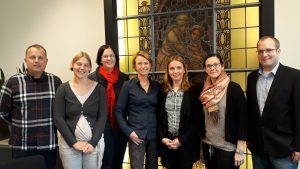 The first meeting was organised at Maastricht University, The Netherlands, at the department of Midwifery Education and Studies (Akademie Verlorskunde). We met with the head of the department Willeke Boom and her colleague Meike Beukema. The outcomes of the project were presented together with the printed version of the learning modules. The project was met with great interest and access statistics from the platform shows that we now have more active users from the Netherlands. 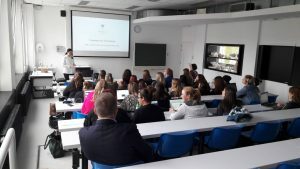 The second event was held during a congress „Mother and Child Republic“ organised at Hogeschool PXL, Hasselt, Belgium. A 30-minute presentation of the project to the students and academic staff was followed by a discussion. The students showed interest in the project and appreciated the online access. The presentation focused on the benefits of the HELP programme and the use of the platform. It also highlighted the recent European Language Label award. Students appreciated the programme usefulness for their Erasmus internships within Europe and Africa and a possible career abroad. 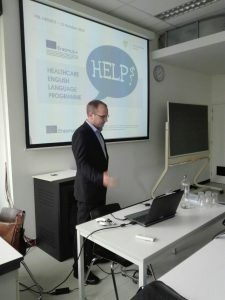 Afterwards, an exchange of good practices and experience from similar language projects followed with the academic staff from PXL Hasselt. The overall impression from these meeting was very good and the HELP project outcomes were met with great appreciation and were seen as very useful.